Willistead Manor is a mansion in Windsor, Ontario. Located in a 15-acre park, Willistead Manor is a historic landmark in the city and is frequently used as a location for special events, weddings, and receptions. The Manor also has catering available, as well as public and private group tours. The Manor was built in 1906 by Albert Kahn, a well-respected architect from Detroit, for Edward Chandler Walker, the second son of Hiram Walker. Kahn was responsible for construction of the manor house, the coach house, and the gate house. Construction of the main building began in 1904. 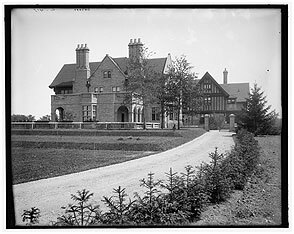 Though they moved into the Manor in 1906, Edward and his wife, Mary Elizabeth Griffin Walker, resided in the manor for a short time (nine years) until Edward’s death in 1915. Mary gave the Manor to the town of Walkerville in 1921, and the building came under ownership of the City of Windsor in 1935. In the past, Willistead Manor has been used as the location of the Walkerville Town Council Chambers, the Art Gallery of Windsor, and the Walkerville Public Library (which became the Windsor Public Library in 1935 after Walkerville amalgamated with the city). The building displays many notable architectural features, with the great hall alone being adorned by a grand oak staircase and an Elizabethan fireplace. The exterior of the Manor is composed of gray limestone from nearby Amherstburg. The Manor also consists of a library, billiard room, drawing room, conservatory, and morning room. The park surrounding the Manor includes the Paul Martin Gardens, which were opened to the public in 1996. City of Windsor. (2017). Willistead Manor. City of Windsor. Coles, P. (1985). Coach House Feasibility Study, Willistead Manor, City Of Windsor, Ontario. Windsor, Ont. : Dept. of Parks and Recreation. Coles, P. (1977). Willistead Manor Study for the Corporation of the City of Windsor. Windsor, Ont. : City Council. Problems of Interpretations. J. M. Pratt. The Crown Jewel of Walkerville. Walkerville Times. Willistead Manor. (2000). Willistead Manor, Inc. Annual Report. Windsor, Ont. : Corporation of the City of Windsor and the Board of Directors Willistead Manor Inc.
Wright, R. (2013, Nov 11). Antique buffs drawn to willistead; hundreds look for that perfect treasure. The Windsor Star.